The current tallest building is the Burj Khalifa in Dubai. That’s going to change in 2020 though. Saudi Arabia is currently building Jeddah Tower which is set to be 3,280 feet (1,000 meters) tall when it is completed. That will be about 236 feet (72 meters) taller than the Burj Khalifa. In 2017, CNN visited and the tower was already a quarter of the way there at 826 feet or 252 meters. The tower is currently surrounded by desert, but once it is finished, it is designed to become the center of Jeddah Economic City. It will be surrounded by residential areas, malls, businesses, hotels, and even tourist attractions. Unfortunately, Jeddah Tower has had some problems. 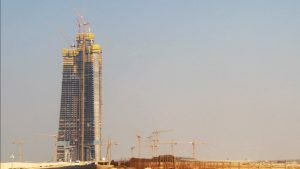 Prince Al-Waleed bin Talal of Saudi Arabia and Bakr Bin Laden are both key players in the building of the tower, but both are also caught up in an anti-corruption purge. This could continue to delay the construction of what is sure to be a magnificent building.